Suzanne was born in Scarborough and she moved to the Niagara region just over eleven years ago. Suzanne has many wonderful memories surrounding food with her entire family from her grandmother, mother, father, brother, aunts and cousins. It was her love of cooking that propelled her to get her first job at a resort working in the kitchen when she was 14 years old, in her cottage town of Parry Sound. Suzanne attended Brock University in 2007 but she quickly realized that university was not for her so she took a year off and continued to work in kitchens in the Niagara area, following her love of food. 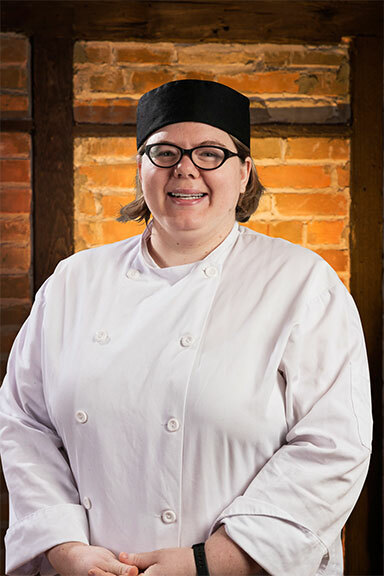 Since it was very apparent that cooking was her true love, Suzanne decided to attend the Niagara College Culinary Management program and she graduated in 2016. Throughout Culinary school, Suzanne volunteered at many events and she fell in love with all that the Niagara region had to offer in the food and wine industry. Suzanne has now been working in the culinary industry for fifteen years in many positions from dishwasher to Kitchen Manager. During her time at Niagara College, Suzanne did her co-op at Shaw Café and Wine Bar in Niagara-on-the-Lake. She stayed on after the completion of her program to develop her culinary skills and kitchen knowledge, eventually becoming Kitchen Manager there. When Suzanne had started looking for a new job and was looking for a change, she was excited to respond to the job posting at Lake House. She had heard of the great reputation that Lake House had and she was excited to become a part of our team. Suzanne has been working at Lake House for almost one year and she has become a valuable member of our team being recently promoted to Chef de Partie of the Garde section.